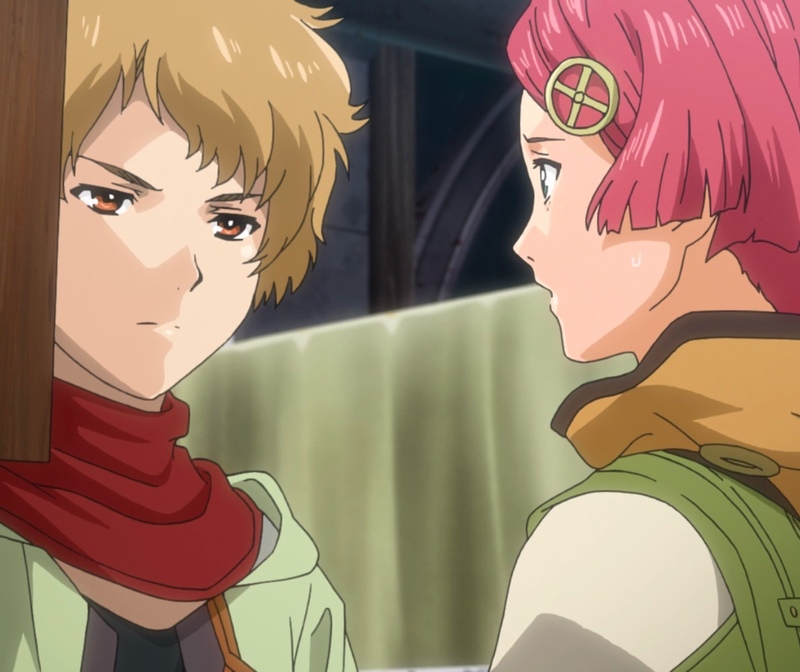 In Begging the Heavens, the seventh episode of Kabaneri of the Iron Fortress, the break-neck pace of the first part of the season eases up a bit. The Koutetsujou finds a station that’s still populated by humans. Mumei get to enjoy herself for a change — she even goes shopping with Yukina, Kajika, and others! Ikoma and Takumi teach a bushi to be more polite to a merchant. And finally, we get to meet Mumei’s brother, Biba. Ayame found something to keep her busy as she waited for the station’s lord. Capture from the Amazon Prime Stream. The Koutetsujou finds Shitori Station still full of living people (instead of Kabane), and they stop for some much needed provisions. Ayame takes Kurusu and Kibito on a courtesy call to the station’s leaders, who were busy meeting with a representative of the Shogunate. That visit is filled with political intrigue and bodes badly for our heroes. After waiting for as long as Ayame thought was enough, she decides to demonstrate their jet bullets to a minister. He finds the demonstration so impressive that he agrees to help provision the train. Meanwhile, Ikoma and Takumi were stocking up on supplies when a bushi barges in and demands the merchant drop what he was doing to fix the bushi’s gun. Takumi objects so strongly that the bushi drew his sword in retaliation. Fortunately for Takumi, Ikoma intervenes and throws the bushi into the street. Ikoma promises to tell the merchant about their jet bullets. Mumei, Yukina, and Kajika finish shopping. They seem to have had a great time. Mumei even bought a hair clip with little wind chimes. When Mumei sees the bamboo tree that Kajika purchased, she suddenly remembers her mother. The memory forces her to leave the party. Ikoma, the first one to notice she’s missing, goes after her and learns more of her past — and of connection to the present that might place them all in grave danger. The Koutetsujou, filled with hungry people low on supplies, approaches Shitori Station. They’re relieved when they find that it hasn’t fallen to the Kabane. Ayame immediately goes to visit the lord of the station with Kurusu and Kibito. She leaves the council of whiners in charge. * Before she leaves, she asks Ikoma to buy more of the metal they need for the jet bullets (bullets Ikoma and Takumi invented that can pierce a Kabane’s heart). They collectively realize that today is Tanabata, the day people write their wishes on small strips of paper and tie them to bamboo branches. Mumei doesn’t remember what Tanabata is. Everyone without a mission washes clothes, cleans bedding, or in general helps tidy up things. 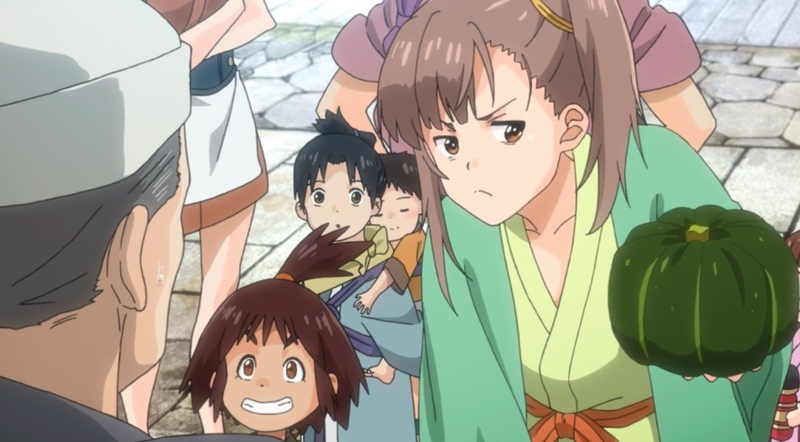 Kajika gives one of the little ones a lesson in merchant negotiation — and amazes Mumei in the process! Capture from the Amazon Prime Stream. After the realizations from last week, Mumei finally feels at home with Kajika and the others. She’s even looking forward to buying new clothes. Kajika goes out of her way to ask that Mumei come along, ostensively to be their bodyguard. But Mumei learns that Kajika is a fierce negotiator — so much so that the merchants fear and respect her. As Ikoma and Takumi buy the metal they need from a merchant, a local bushi bursts in and demands the merchant attend to him. The bushi reacts with disgust that the merchant would help a “lowly steam smith” before a bushi. He goes so far as to draw his sword against Takumi. But he didn’t count on Ikoma’s (hidden) Kabaneri strength. The bushi found himself thrown out the door. A little boy approaches Yukina as she and Sukari buy supplies. He says his dad’s like them, but he was on the train named Husoujyo. Yukina recognizes the name — it’s the train that crashed into her home, Aragane Station, so she knew his father was now a Kabane. She tries to hide her knowledge, but Sukari tells the child that his father’s dead. Yukina’s furious, but Sukari says that he wishes someone had told him when his father died, so he wouldn’t have had to carry the burden of doubt that he did as a child. Meanwhile, the lord of Shitori Station is keeping Ayame waiting. Kurusu and Kibito interpret that to mean they’re not welcome. Kurusu takes exception to not even being allowed to negotiate, saying that the station’s leadership is fighting the wrong enemy. Kibito says that Kurusu sounds like Ikoma. In order to attract the right kind of attention, Ayame arranges for a demonstration of their yet bullets. When the station’s minister sees what they can do, he immediately promises to give them provisions and take in their sick and injured — as long as he can get the schematics for the weapon. Shitori Station’s lord is not happy that he’s going to be caught up in the Shogunate’s power struggles. Capture from the Amazon Prime Stream. As it turns out, the station’s lord was detained because he was meeting with Kogenta, a representative of the Shogunate. 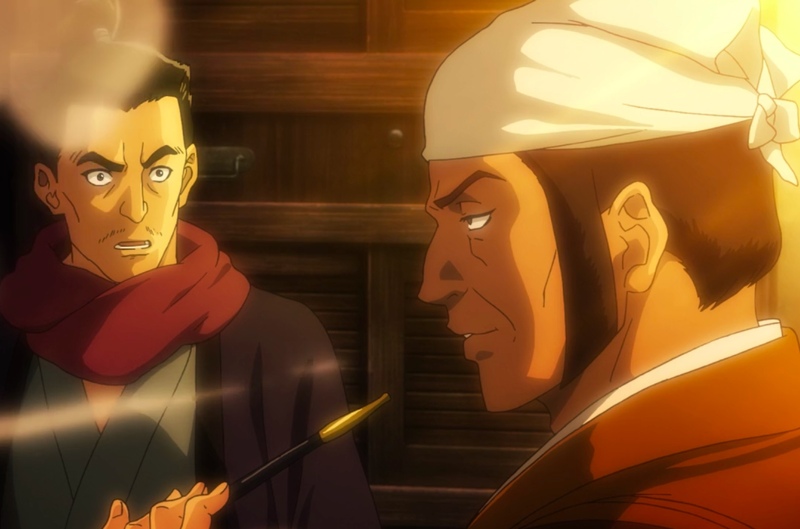 Enoku, the man who had threatened Mumei in an earlier episode, is with him. Kogenta says that the Liberator (apparently, Mumei’s brother) will be Shitori Station soon, whereupon the station’s lord protests that he doesn’t want to become involved in any power struggles. Kogenta tells him that he’s already involved after that incident 10 years ago. Ikoma, Mumei, Kajika, and the rest meet after their shopping spree. Kajika bought a bamboo tree, and seeing it triggers Mumei’s memory of her mother hanging a wish during a Tanabata years ago. She disappears, and Ikoma goes after her. After they share dinner, she confides that she remembered she had, in fact, celebrated Tanabata with her mom, who called her by her real name, Hodsumi. She’s delighted when Ikoma shows her how it was likely spelled. Maybe because they’re alone and their shared Kabaneri nature encouraged her trust, she tells him her greatest fear: that at any moment, she might lose her mind and become a Kabane. The thought haunts her day and night. She tries to turn it into a joke, saying Kabane Mumei biting everyone would be a terrible way to start a day, but resolve crystalizes within Ikoma. He tells her that he’s going to destroy the Kabane so she won’t feel the need to fight anymore. Then he’s going to rebuild the rice paddies and turn her back into a human again. 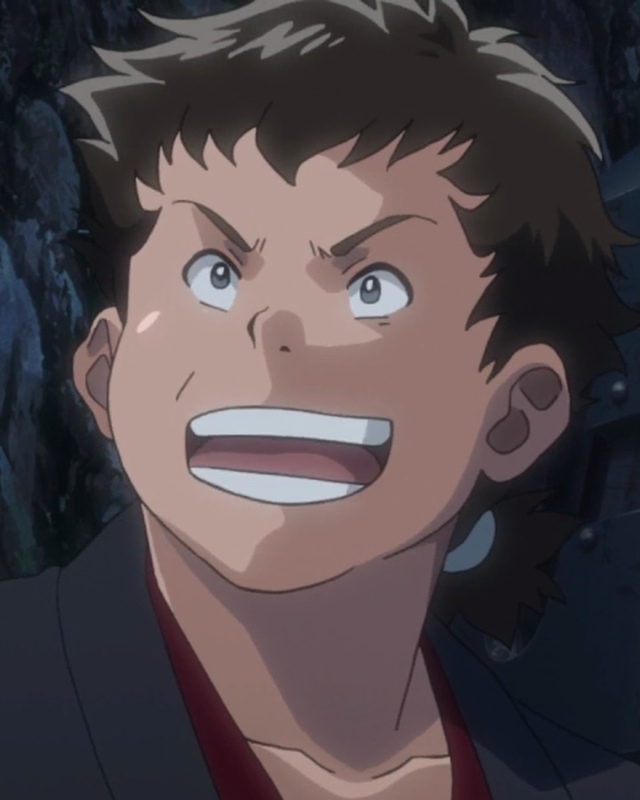 Instead of arguing or calling him insane, Mumei just smiles at him. Back at the Koutetsujou, everyone’s writing their wishes to hang on the bamboo tree that Kajika purchased. Mumei playfully steals Takumi’s wish and reads it. She feels a little embarrassed when his wish was just to survive. Ikoma sees the exchange and announces that his wish is to destroy the Kabane, retake their land, and take back their stations. Sukari protests that the wish is too much. Ikoma’s answer? He says he’s through with just being alive. Ayame picks up on the theme, saying she wants to reopen Aragane Station. Mumei tries to joke about her fear of becoming a Kabane and turning on everyone, but Ikoma’s not fooled. Capture from the Amazon Prime Stream. The spirit is infectious. Takumi amends his wish: now, he wants to be rich and have three beautiful wives. Kajika wants to be a teacher. Yukina wants her own train (but she won’t let Sukari ride on it). As they talked, Shitori Station set off their Tanabata fireworks. That would have been a pleasant end to the episode. But the next morning, Ikoma, relaxing in the Koutetsujou as his friends slept all around him, reflects that Mumei’s brother was the one who made her give up the name Hodsumi and had taught her that the weak deserved to die. He hears the crowd outside begin to get excited. They are cheering the return of the Hunters and the Liberator. These Hunters destroy Kabane and return the land to the people. Mumei rushes forward to greet Biba as her brother. As she shares a happy greeting with him, Ikoma resolves to find out of Biba’s a real hero or something else. * I really hope this decision doesn’t come back to bite her. It was nice seeing the colorful swathes of cloth in Shitori Station. It represented a quiet space away from the Kabane where people could still create something beautiful. It also represented a world that gave our heroes something meaningful to fight for. Kajika asks Mumei to come along to protect them as they shop. So Mumei wasn’t prepared to see sweet, motherly Kajika turn into a lioness when it came to negotiating a good price for goods. Mumei came away from the experience with a newfound respect for Kajika. Ikoma criticizes the bushi that tried to slash Takumi for having bad form before throwing him out the door. Apparently, Ikoma has been paying attention during Mumei’s instruction! Not only that, but Takumi didn’t even flinch with the bushi tried to slash him. I think he trusted Ikoma to take care of him. Personally, I think that’d take a lot of trust! Sukari surprised Yukina with the story of how his father died. Capture from the Amazon Prime Stream. We got to learn why Sukari has such a cynical, gruff attitude: during his childhood, Kabane had killed his father, and no one wanted to break the bad news to him. So, when he told the little boy that his father was dead, in his mind, Sukari was being kind. Yukina seemed surprised. I’m not sure if she was surprised that Sukari would confide in her, or if she was surprised that he wasn’t just being a jerk. Or both! When Ikoma storms off to look for Mumei, he grumbles that she didn’t take her lunch with her. Kajika’s confused, but Yukina mimics cutting her wrist, and Kajika realizes Ikoma meant that Mumei didn’t have a container of blood with her. If Mumei got too hungry, her veins and heart would glow, and that would be problematic — to say the least! Ikoma shouted a lot less this episode — which was a welcome change! It’s gotten so bad that even Mumei laughed at how serious he was when he showed her how to write her name. In this episode, we learned that they can no longer cultivate rice. They’re basically trapped in stations and don’t have enough of the kind of farm land needed to grow rice. I like realistic details like this. Mumei desperately wants to be strong. So much so that even when she’s sharing her deepest fear with Ikoma, she turns it into a joke and tries to seem like it really doesn’t bother her. 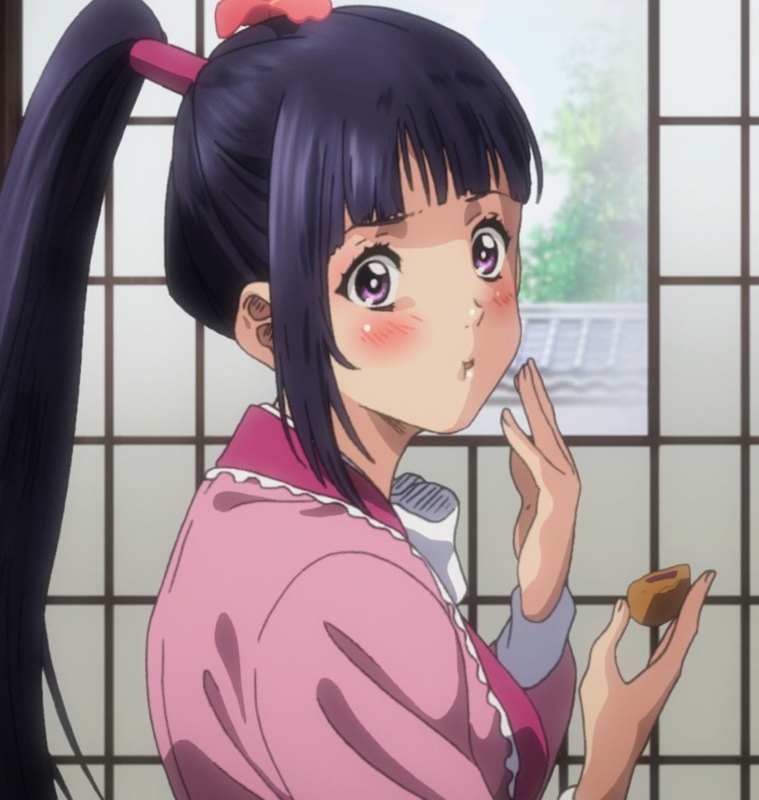 Her character’s complex and interesting, and she’s gone through a lot of changes in seven episodes. I can’t wait to see where she goes next. Takumi’s not the least bit embarrassed that Mumei read his wish. Nonchalantly, he asked, “What else are we going to be wishing for?” He’s even less inhibited later when he announces that he’d really like to have three beautiful wives — because he wants to dream big! Takumi’s big dream is to have three beautiful wives. He seems really excited about it! Capture from the Amazon Prime Stream. When Ayame shares her wish that she wants to reopen Aragane Station, some of listeners smile, and for a moment she thinks she said something strange. Kurusu supports her by saying he thinks her father would be proud. I like their relationship. He’s not just some bone-head swordsman. Everything he’s done has been to protect Ayame, and seen in that light, it’s actually kinda of endearing. Like when she asks him his wish and he can’t stop blushing. I wonder what he wished for! Yukina refuses to let Sukari ride on the train she’s wished for — but her response was playful. Did their talk earlier about his father’s death change her opinion of him? Was he being honest about his father? If so, it explains a lot about how he’s conducted himself. They might make a good couple! They’re both practical, no-nonsense, and extremely competent. Kibito stood right beside the metal target as Kurusu fired a jet bullet as a demonstration for the minister. That’s just bad technique. You should always clear the range before firing! Those guns are dangerous! Plus, you never know when you’re going to get a ricochet or shrapnel from the point of impact. A couple of things about this episode jumped out at me. First was how colorful it was. From the hanging bolts of cloth to the sunset colors glowing around Ikoma and Mumei, the art looked lush this week. I think the Kabaneri’s art has always been good, but with this week’s slower pace, I was able to take in more of it. Its vibrancy helps the show come alive. Second, this episode showed a subtle hand with characterization. I had to admit I’m surprised. I didn’t expect a show this fast-paced and energetic to show much character development. 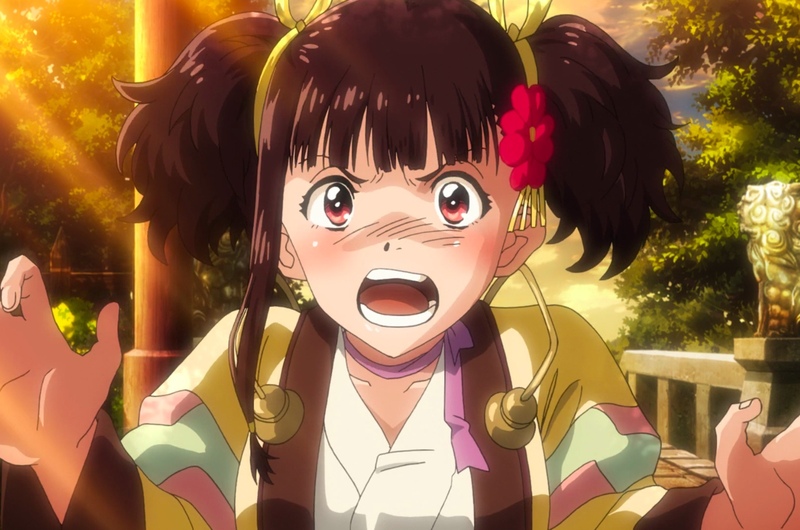 We caught a glimpse of Mumei’s fear of becoming a Kabane in a relatable way. We saw Ikoma begin to morph his desire to destroy the Kabane from an abstract “save humanity” to “make Mumei human again.” Concrete’s so much better in this context. It makes Ikoma feel more believable to me. We even got to see Kurusu showing gentle signs of his affection for Ayame. Biba’s arrival could take the plot in a whole new direction. Kabaneri’s always had a political subplot, but Biba’s popularity and potential despotism could force a complicated confrontation with Ikoma. Who would Mumei side with in such a fight? Would Ayame throw her weight behind Ikoma, or the Shogunate? Action’s great, but action plus fascinating characters plus a compelling political backdrop is even better!